Congrats on getting Senior Moderator my man! And so it begins. Only 12 more days. Are you ready to celebrate it on Willow's page? BanananaBread and bigbluu722 like this. Punane and bigbluu722 like this. Thanks a bunch, hope to see you around again sometime soon! My ceiling isn’t the best but it’s up there. Preparing to drop the bomb. Hey, it's that bluu guy! Punane, Tipsied and BanananaBread like this. Had resigned for a bit, so have to make it through the ranks again before admin. Hes lying, he got demoted. 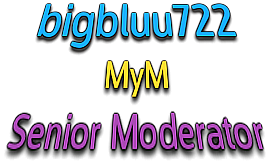 Gratz on jr mod m8! Insert status update here v3. Rhetorical questions are the best kinds of questions. SanndyTheManndy, Punane, BanananaBread and 1 other person like this. No job and no sleepin', livin' up like it's the weekend. Punane, BanananaBread and profrags like this.